Traveled to Sitka in the summer of 1972 to commercial fish. Fell in love with the landscape, the community and the life style and never really left. I have worked in many capacities, have moved a couple of times for short periods and am continually drawn back. We have lived for 27 years on a small (16 acre) island, about 3 miles outside of Sitka with 5 other families. Raised our children on the island boating back and forth for work, school, town play and necessities. It is a very active lifestyle that suits me well. We spend a lot of time boating, hiking, camping, traveling and living the dream. My son, Adam, graduated from WWU and is now back in Sitka commercial fishing, again. (A habit he has no desire to shake). 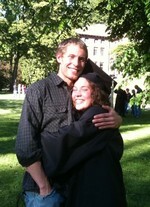 My daughter, Maury, graduates from WWU this June in Wilderness Therapy. Thank you for sharing your stories. They have been interesting, humorous, sobering and a delight to read. Play was wonderful for me. To many memories to share here, all of them bring me a smile. Adam and Maury at Graduation 2010.